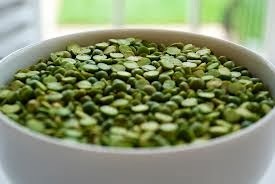 I think that a well made soup is a real treat and when I have the time I like to make a batch of split pea soup. It is so much better than any sort of store bought soup from a can and it makes a perfect winter meal. If you want to stretch it or make it even more hearty, you can also add potatoes. This makes a lot, so unless your serving a large family, you can have left overs and I think it tastes even better the next day. In a sauté pan, and add the oil and sauté the carrots, garlic, onions and celery until translucent. Do not brown them. Add this mixture into the heavy pan and then add the liquid smoke, salt, black pepper, bay leaves, marjoram and thyme and stir well. Allow the soup to simmer covered for at least 4-5 hours, stirring to keep it from sticking. If you wish, you can blend the soup in a food processor, to give it a smooth consistency, or use a handled food processor. Once this is done, allow the soup to cook for another 1-2 hours and then serve as desired. Have you thought about making this with Indian style lentils? Would be fab, too! I have not, but I love the idea. What sort of lentils would you suggest? There are so many types. So far I've only experimented with Moong Dal using the whole green moong beans, which I must admit is very good. I've put that recipe on my blog. Thanks!